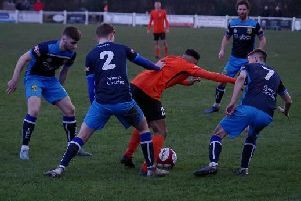 Tadcaster Albion extended their unbeaten league run to five matches with a 1-0 victory at Kendal Town in Evo-Stik Division One North. The only goal of the game came from the penalty spot in the final minute of the first half, Aaron Hardy converting to move the in-form Brewers up to eighth in the table, just two points away from a play-off spot. Manager Michael Morton named an unchanged team to the one that thrashed Glossop North End in their last league outing, with new signing Mitch Langton named on the bench. And Taddy started brightly in the Cumbrian sunshine as Aiden Savory curled inches wide of the mark on three minutes. Albion were certainly the better of the two teams in the opening stages, looking dangerous in the final third with Billy Whitehouse, Casey Stewart and Aiden Savory. Shortly after the quarter of an hour-mark, striker Savory was dragged down by Paul Alexander as he looked to run through on goal. The Kendal man was the last defender, but the clash occurred 40 yards from goal, so the referee chose to brandish a yellow card rather than a game-changing red. Tadcaster continued to threaten the Kendal goal and defender Fraser Papprill saw his acrobatic volley deflect just over. Brewers stopper Michael Ingham was only called into action once in the first 45, but it was to make a superb save high to his left to keep out Steven Yawson’s side-footed strike. At the other end, Stewart slid a divine through-ball in behind allowing Whitehouse to exploit the space and round home goalkeeper Matt Johnson, but Ben Thomas recovered just in time to block his shot. The two came together inside the box again on the stroke of half-time, but this time the Kendal defender was late and rash, bringing Whitehouse down and conceding a penalty. Full-back Hardy picked up the ball and placed it on a mound of mud where the penalty spot should have been. It didn’t faze the experienced defender, however, and he coolly side-footed past Johnson in the Town goal to give the Brewers the lead at the break. The Mintcakes started the second period with greater intensity and Paul Dawson saw his low effort held by Ingham before Hardy cleared Martin Grundy’s effort off the goal-line. With Taddy under the cosh, Robert Bowman slowly jinked his way deep into the penalty area, but just as the striker was about to pull the trigger, Corey Roper timed his tackle perfectly to stab the ball clear. Gloveman Ingham was far from busy between the sticks, but when called upon he made saves of the highest quality. The pick of the bunch came on the hour-mark with his defence static and appealing for offside. The flag did not materialise, however, and Bowman was denied by the outstretched foot of the Northern Irishman. As Kendal pushed more bodies forward to try and salvage something, there was space in behind for Albion to counter and they should have made sure of the points with 15 minutes to go. Whitehouse just failed to cap a fine performance with a goal after superbly turning away from his man in the penalty area but firing straight at Johnson.